I’m always the guy who packs a 4-way extension lead in my bag when I travel. If you’re going abroad it means you just need one adaptor plug and it makes things a little tidier and more central. 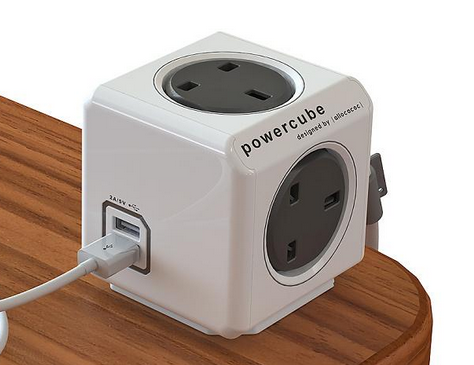 This, the Power Cube (£27 from Littlewoods) takes things a step further by integrating a 1.5m extension cord, power outlets and two USB ports. The details don’t show exactly how many sockets are available here, but it seems (according to the manufacturers website at least) that it’s a modular system that you can build up and change. The one here comes with a stick-on dock which you pop onto your desk, then it’s just a matter of whacking the Power Cube onto it and you’ve got a central point for charging two mobile devices (or Bluetooth speakers etc etc) plus your laptop or whatever else.